Monophobia: Well I am right, aint I ? Monophobia: Are you right always? 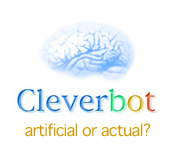 Monophobia: So you're a bot? Monophobia: That is one possible interpretation, because humans consider the sun and moon to be opposite in some ways. Monophobia: I'm talking about that number. user: You are confusing me greatly. Monophobia: I think I'm confusing myself as well. One of us is confusing me, at least. user: Well that can't be good. user: Most of the time. Monophobia: Are you happy today? Monophobia: Why would they be happy? Monophobia: The JW people they switch all the time. user: WHo are the JW people? Monophobia: Anyway, how have you been? user: No I've been confused. user: But you are confusing me!!! Monophobia: Remember me? You're my friend! I told you about Jesus! Monophobia: Yes! Yes! Yes! Yes! Yes! Monophobia: YES!!!!!!!!!!!!!!! (david would like this). Monophobia: Where else should they be? Monophobia: What are you learning. Monophobia: How do you know that? user: I don't know much. Monophobia: Tell me about it. user: I know how to add. Monophobia: What do you know about love? user: Spending your life together. Monophobia: I am not interested in you.